Some quick background: A few weeks back, I wrote a column for the Greenville Journal about something that had been on my mind. I missed The Handlebar. I know, it’s a tired complaint by this point, but that’s what I was thinking about that day. Today, several days after it ran in the printed Journal, it got picked up online and started spreading. Before I’d eaten breakfast, I was persona non grata in every good music venue in town. It’s not been my favorite day. At first, I couldn’t figure out why my point went so wildly astray. In fact, it was only just now at 5pm that someone pointed out to me what the Greenville Journal’s social media people posted on Facebook. It’s not in my nature to find a bus and throw somebody under it, but damned if I don’t find myself ready to do just that. Let’s be clear: I didn’t write that line. I think that line is false. The fact that line is attached to my name has turned me (an old, tired, nearly-washed-up writer guy) into an apoplectic, cursing, footstomping lunatic. So, here I sit after a day of trying to figure out what in the hell just happened, trying to figure out, beyond that, what to do about it. When I wrote the piece, I set out to make this point: Greenville’s marketing arm celebrates itself in Top Ten lists around the country. It celebrates the #YeahThatGreenville hashtag and all that it represents. The city marketing machine, however, does precious little to support the music community. The noise ordinance can be too restrictive. The marketing doesn’t do much to push the local music scene to the big magazines. It has the ability to support venues and musicians, but it doesn’t do enough. Nor, for that matter, do the local people who don’t want to buy tickets to see local acts play. That was the point I set out to make. That the city leaders and the marketing people behind Greenville could do more to help the scene. And they aren’t. When the piece ran in the printed paper last week, I didn’t hear one peep from anyone. I literally thought it was a dud. Well, of course they are going to be pissed off. Thing is: I don’t believe that at all, and it was a complete misinterpretation of the point I hoped to make. I love the local clubs. I don’t get out as much as I used to, but I still go, and I appreciate that running those venues is often thankless work. I have great admiration for the people who do it, and the fact that people think I don’t makes me sorry. The point I was hoping to make stands: the city should do more to support music and help fill that mid-sized club hole. I’m no expert. I’m not a guy who could run a damned club. But I love music, and I love Greenville, and I sincerely just wanted the people who run this city to know that. I’ve had some good conversations with good people today, including the folks at Greer’s The Spinning Jenny, a venue that is working hard to fill that one niche I was talking about. But I’ve also talked with other people. Bookers, musicians, and other journalists. Some folks said just to eat it and let it blow over. Others listened to my explanations privately and said they understand where I’m coming from. The coolest thing that’s happened is having local artists contact me privately and invite me to come see them play. If you disagree with the article itself, I can appreciate that. We can disagree about the need for a venue that size. I still would like one. And if I didn’t make my point well enough or if it seemed like I was blaming any of the hardworking music community for that, that’s on me. It probably wasn’t the most elegant thing I’ve written. Let me come to your show. I’ll buy the beer and help you load out. 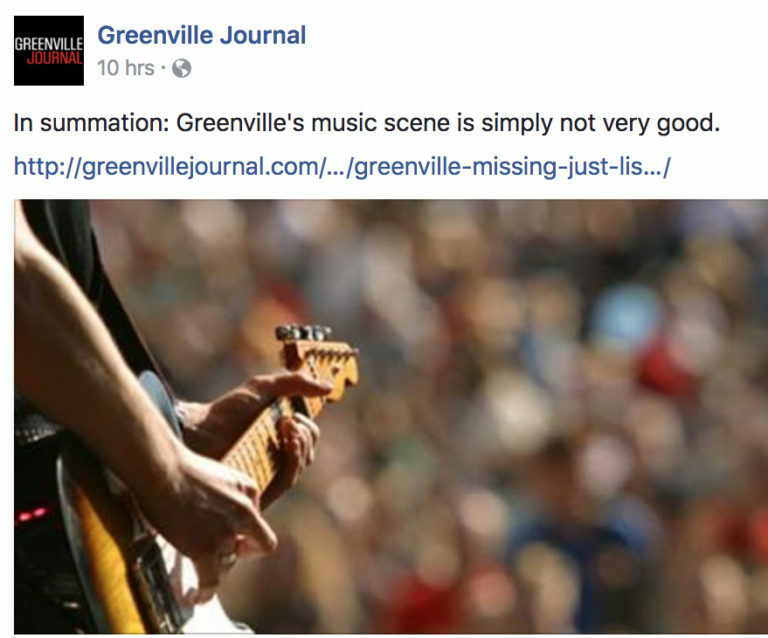 But if you think that I wrote “In summation: Greenville’s music scene is simply not very good,” I beg you to think again. I didn’t write it. I don’t believe it. And I’ll stand in the middle of Main Street and scream until everybody knows that. I don’t think there’s a market for a Handlebar here anymore—–if we can’t fill up the venues we have in spite of high quality local, regional and touring music, I don’t know why someone would invest hundreds of thousands into a space like that. We have enormous support for all the arts. We don’t have a market for any of them, though. Still, music has more of a market here than any of the rest. Goodness, you were misquoted in the media. Just taking a walk through the blogisphere to catch up with people I enjoy reading and saw this. I, too, have been misquoted and misrepresented in media and it takes a lot of talking… and listening to clear up the mess. I am so glad you didn’t just wait for things to blow over as it DOES stick with people from the moment they read it. They might temporarily forget, but it’s there the next time they see you. So speaking up and clearing the air quickly is the best way to reshape the way others see you. I’m sure those with whom you spoke hold you in high esteem for having the difficult and uncomfortable conversation. Regarding the state of smaller/mid-sized music venues — in Greenville or anywhere else — the sad fact is that while they offer up great entertainment, fewer people are going out to catch live shows. Venues either have to broaden their rosters, open only once or twice a week, open only when ticket pre-sales warrant it, or all of the above. And based on those parameters, you’d have to have deep pockets to keep the place running. Most venue owners aren’t in that position. This is happening all across the country. Artists aren’t getting paid enough to travel to gigs in these places, and if they do make the effort, there’s no guarantee of an audience. It’s extremely disheartening for them, the venue owners, as well as music fans. It’s a shame to have to say goodbye to the venues we love and it would be wonderful if we never had to. That’s just not the world in which we live any longer. Until something changes to make owning a venue becomes more affordable, we have to continue to support those still in operation and maybe say a prayer or two they stay afloat for everyone’s sake. Fingers crossed that you get your wish and have another Handlebar in your life sometime soon.